We continue to belief that any sell off will be short as it has been since 2000. 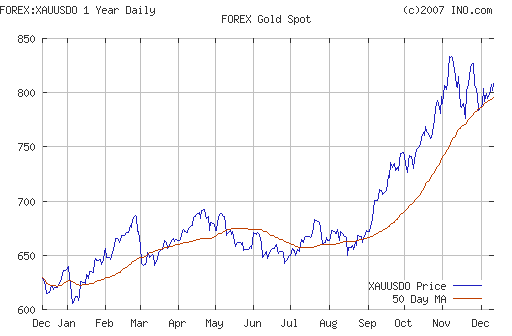 Gold will likely end 2007 above $800 per ounce before making new record highs early in 2008. This is especially the case given the continuing deterioration of the global financial and monetary system (as outlined below). There is support at $776 and strong support at $750. The global macroeconomic climate continues to deteriorate. One of Britain's leading economists has warned of an economy that could "make 1929 look like a walk in the park." Peter Spencer of the Ernst & Young Item Club, is calling for a suspension of the Basel banking rules that influence financial systems worldwide. The Basel rules are adding to the current financial crisis, said Peter Spencer, who warned of an economy that could "make 1929 look like a walk in the park" if the rules are not relaxed, Britain's Telegraph reported Saturday. The Basel rules determine how much capital banks must raise to keep their accounts in order. Under the rules, banks forced to take off-balance sheet assets from troubled investment vehicles onto their books must raise cash from overseas or cut back dramatically on their spending, Spencer said. Having just those two options is freezing money markets and deepening the credit crisis, Spencer said, recommending the Basel capital requirement level be cut from 8 percent to 6 percent, the Telegraph reported. He warned that, if London's money markets remained frozen and the authorities retain the strict Basel regulations, the full scale of the eventual credit crunch and economic slump could be "disastrous". Capital requirements are the only control on financial institutions and banks have and eliminating them would be a drastic action which could ultimately lead to greater financial problems. This is another short term panacea at best. Gordon Brown's selling off of the UK's gold reserves at the bottom of the market was strongly criticised by ex UK Prime Minister John Major on BBC at the weekend. He said that Gordon Brown's decision to sell much of Britain's gold reserves in 1999 had lost the economy billions of pounds. Major warned of bleak economic times ahead, adding: "It's beginning to unravel in quite a serious way. The economy is running into serious difficulty." A virulent strain of stagflation looks set to hit many western economies as economic growth slows down in a very inflationary environment. The FT reports that a second wave of food price inflation is set to hit the world's leading economies as new agricultural benchmark prices are reset today at much higher levels. In Chicago, wheat and rice prices for delivery in March 2008 have jumped to an all-time record, soyabean prices have surged to a 34-year high and corn prices have hit a 11-year peak. As these record levels become the benchmark for the food industry today, knock-on price rises are set to hit consumers in coming months, raising inflationary pressure and constraining the ability of central banks to mitigate the economic slowdown. A first wave of surging cereals prices that hit the wholesale market during the summer has now fed through the supply chain and contributed to rising inflation. Cereals supply was this season lower than expected as several major countries suffered weather-related losses. Global warming was cited as a factor. Jean Bourlot, head of agriculture commodities at Morgan Stanley in London, said: "High cereals prices are here to stay." High food and commodity prices are here to stay unless there is a serious deflationary 1930's style crash. Serious stagflation looks more likely at present. Stagflation is very bullish for gold. Delfation is also bullish for gold as it was in the 1930's when the US revalued gold from the fixed $22 per ounce to $35 per ounce or by some 60%. Silver is trading at $13.75/80 at 1200 GMT after yesterday's sharp sell off. Platinum was trading at $1472/1476 (1200 GMT). Spot palladium was trading at $348/354 an ounce (1200 GMT). Oil remains at elevated levels above $90 per barrel and was trading at over $93 a barrel.